Cover artwork by Trevor Brown. 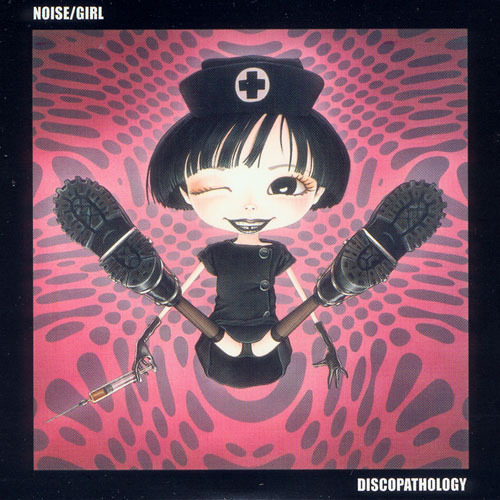 During the late '90s, London-Tokyo harsh noise unit Noise/Girl became one of the Japanoise underground's most respected live performers, and renowned for a denser and more complex sound than most contemporaries. Suddenly in 2000, Noise/Girl disappeared. After four years missing and presumed dead, frontman Lucifer has resurfaced with live performances and a CD full of new tracks and unreleased material. Trevor Brown, a fellow British ex-Patriot in Tokyo, has provided the cover artwork n a signature adorably unsettling illustration. Trevor is known for his fetishistic, unavoidable, brutally disturbing, and highly collectible covers for John Zorn, Dead Pop Stars, Jarboe, Merzbow, GG Allin, Coil, Supersuckers, Brighter Death Now, Whitehouse and Venetian Snares. At 500 copies, the supply of Discopathology will not last long. This CD is the final epitaph and culmination of Noise/Girl: a super-heavy noise album that you can also boogie to. Deep, harsh, psychedelic noise engulfs disco and funk, which has somehow traveled through the looking glass and into another dimension of howling feedback and brutal bass frequencies. Featuring some tracks to dance to, some tracks nobody in their right minds would try to dance to, and a remastered version of the legendary 12" single "Discopathology," described by the NME as "a terrifying record n deserves to be a big-room floor-filer...immortality beckons." The Discopathology CD is loud and harsh enough to satisfy fans of Merzbow or Whitehouse, complex enough to reward repeated listenings, and most unexpectedly of all: it is booty-shakingly funky.